Estate Planning Services for Lincolnshire, Illinois | Hedeker Law Ltd. Creating an all-inclusive estate plan that protects you, your assets, and your loved ones is one of the most important endeavors you will undertake over the course of your lifetime. It stands to reason, therefore, that choosing the right attorney to help you create your estate plan should be an equally important decision. The attorneys and staff at the Lincolnshire, Illinois law firm of Hedeker Law Ltd. understand how important your estate plan is to you and your family and we would be honored to work with you to create a personalized plan that reflects your individual estate planning needs and goals. The original inhabitants of what would later become Lincolnshire, Illinois were Native American Potawatomi migrants from Canada and Wisconsin who left the cold north in search of a warmer climate during the 16th century. A century later, in 1673, French Jesuit explorers Father Jacques Marquette and Louis Jolliet would become the first Europeans to visit the area. It took yet another century for the area to actually be settled. In 1834, Captain Daniel Wright was the first white settlor to put down roots, gaining permission from the chief to build a cabin on the outskirts of the Potawatomi village on the site of the intersection of present-day Milwaukee Avenue and Aptakisic Road. Not long after, the Potawatomi were defeated by European settlors and forced to relocate. Eventually, the future Lincolnshire was settled as part of the town known as “Half Day.” By the middle of the 19th century, the town of Half Day was a thriving community, complete with a blacksmith’s shop, sawmill, country store, and a church. As was often the case at the time, the fact that the Chicago and Milwaukee Railroad expanded through the area over the next several decades led to the town’s continued growth and prosperity. By the turn of the 20th century, the invention of the automobile allowed residents of Chicago to travel to Half Day easily resulting in the town becoming a popular vacation destination. Following World War I, the Half Day areas was essentially divided up and sold to wealthy farmers. Not long thereafter, developer Roger Ladd purchased a tract of land from one of the farmers that would later become Lincolnshire. Ladd christened the land “Lincolnshire.” Life in the fledgling town of Lincolnshire was problematic, however, because the town lacked a proper infrastructure. Eventually, the village was incorporated in 1957 with help from the Cambridge Forest Association (CFA), which continues to play an important role in the village. Lincolnshire is a village located about miles north of Chicago, Illinois. With a year around population of just over 7,000 residents, Lincolnshire is a popular “bedroom” community alternative to the hustle and bustle of nearby Chicago. After incorporation in 1957, the village growth remained fairly stagnant until the 1980s and 1990s. During that time, the village undertook efforts to expand the downtown area. The expansion efforts centered on the intersection of Aptakisic Road and Milwaukee Avenue. The village’s endeavors included commercial regions like the Lincolnshire Corporate Center, City Park, and the Lincolnshire Commons. Residents and visitors alike enjoy the “Taste of Lincolnshire” each year, an event that mirrors the “Taste of Chicago” put on by its larger neighbor. A few weeks prior to the Taste of Lincolnshire, the Lincolnshire Art Festival is also held each year, offering Lake County artists an opportunity to display their work to the community. Despite its relatively small size, Lincolnshire also has nine public parks for residents to enjoy. Overall, Lincolnshire, Illinois offers residents a small town atmosphere without losing proximity to the dining, shopping, and entertainment options Chicago has to offer. 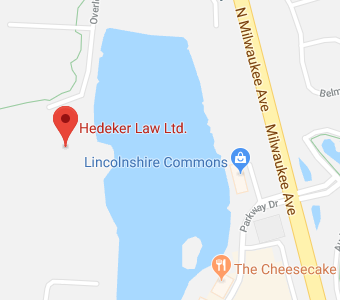 At Hedeker Law Ltd. we are proud to be part of the Lincolnshire community. We share a deeply felt belief that our clients are more than just clients. Because we are part of the Lincolnshire community, our clients are also our friends and neighbors. Consequently, we strive to create lifelong relationships with our clients which helps us to provide personalized advice and guidance relating to their estate plan. Your estate plan is not something you should create and then forget about once it is complete. In fact, your estate plan is never really complete. On the contrary, your estate plan is something that will change and grow as you experience growth and change in your life. Your initial estate plan may be rather basic, including a simple Last Will and Testament and nothing more. Soon thereafter though, you may get married and become a parent. Those life changing events will require additions to your estate plan, such as the inclusion of an incapacity planning component, the creation of a trust agreement, and even revisions to your existing Will. As you go through middle age, and your estate grows, you may need to add asset protection strategies along with tax and probate avoidance techniques in your plan. Finally, as you start thinking about retirement, your plan will need to be reviewed to determine if you need to add additional component such as Medicaid planning, funeral planning, and maybe an advanced directive. The attorneys and staff at Hedeker Law Ltd. understand that creating an individualized estate plan is easier to accomplish when an attorney has more than a passing relationship with the client. We hope to work closely with you throughout your lifetime and earn your trust so that we can help you create an estate plan that truly reflects your estate planning needs and goals. At Hedeker Law Ltd, in Lincolnshire, Illinois, we would strive to create a lasting relationship with you so that we can help you create an estate plan that ensures you, your loved ones, and your assets are protected now and in the future. If you have additional questions or concerns regarding estate planning services, contact the experienced Illinois estate planning attorneys at Hedeker Law, Ltd. by calling (847) 913-5415 to schedule an appointment.